PGA West is one of the largest communities in La Quinta California. Consisting of over 1400 homes and 2200 acres, PGA West offers world-class resort living with dozens of swimming pools, spas, clubhouses, social activities and golf courses. There are three sub-communities within PGA West: the Signature, the Monterra at the Greg Norman, and Griffin Ranch. This master-planned community was designed and established in 1984 in the beautiful La Quinta area just minutes from Palm Springs. This resort and recreational development offer world-class sports such as golf, fitness, and tennis. PGA West is home to six golf courses including the newest Greg Norman course. This community is ideal for the ultimate in social events, golfing, and the resort lifestyle. There's a state of the art Health and Racquet club, tennis, pull swimming pools, spas, and recreational activities. PGA West is located at the base of the Coral mountains with gorgeous surrounding views of the landscape and the desert. Golf courses are designed by Tom Weiskopf, Arnold Palmer, Greg Norman, Jack Nicklaus, and Pete Dye, all legends in their field. The PGA West clubhouse features a variety of venues and social activities year round. Homes in PGA West start at about $500,000 up to $2 million based on size, condition, and location. Many homes feature backyard swimming pools and the ultimate in backyard entertaining. Homeowners dues are about $375 per month and cover common area maintenance and amenities. 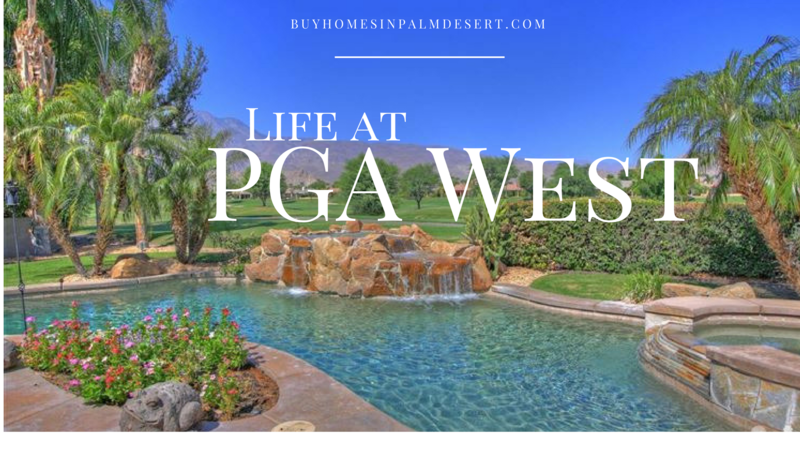 To learn more about homes for sale in PGA West please see available listings below and contact my office to schedule a showing or for a customized list of homes that meet your search criteria and price.